Lisa Young and Joan Leath’s goal is twofold: to inspire children to use their imaginations, and to share their own experience of collaborating as writer and illustrator to make stories become reality. Beatrice Pigeon has lived with her girlfriends her whole life under the awning of a ladies shoe store, secure within the city centre. Enticed by the thought of adventure and driven by a need for new experiences, she joins Nick, a handsome and daring homing pigeon, on a 4,000-kilometer journey to Mexico to deliver a very special message. But is she up to the challenge? The journey holds dangers, risks, uncertainties, and mysteries—there are so many new things to learn and understand. Beatrice will have to battle hawks, fly through blinding snowstorms, and experience strange new exotic places. Would she have been better off listening to her friends who warned her of the dangers? Does she find what she is looking for? Join Beatrice on her journey as she meets fascinating, incredible characters like Red Feather, Juan and, in the dense jungles of Mexico, encounters a Mayan God. Children’s author Lisa Young self-published her first book, The Friendship of Magpie and Crow, with Blitzprint in November of 2008. Her second book, Scamper, was self-published with Blitzprint December of 2009 and won an award at the Paris Book Festival in San Francisco in the spring of 2010. 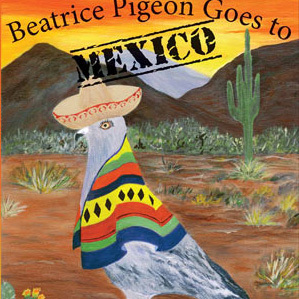 Her third work—a chapter book series titled Beatrice Pigeon goes to Mexico—was published in December of 2010. She looks forward to continuing her relationship with Blitzprint and her editor, Jens Petersen. Lisa has begun her first adult novel, which is set for release in 2012. The second in the Beatrice Pigeon series will be released in the spring of 2012. Her fourth children’s book—a Christmas story in which all of the characters in her books come together—will be released November 2011. Lisa lives in Calgary with her family and two crazy cats. She loves touring local schools and reading to students along with the illustrator of her books, Joan Neath. Their goal is to inspire children with the message to use their imaginations and also to share their experience of collaborating together to make a story become a reality! As Lisa and Joan made presentations to various schools, children kept asking, “When are you going to write a chapter book series?” So Lisa started with a story that had been on her mind for many years—a story about Beatrice Pigeon. Beatrice’s first adventure would involve Mexico, a place Lisa loves and has traveled to many times, as well as Arizona, where she lived for a few years before moving to Calgary. The story was born in a moment one day in downtown Calgary when Lisa was inspired by pigeons cooing above the awning of Arnold Churgin’s shoe store. But it wasn’t until 15 years later, in the summer of 2010, that she sat down and wrote Beatrice! Lisa describes her move into the publishing world as a major learning experience. While challenging, self-publishing has been made much easier thanks not only to technological advancements, but also Blitzprint, where staff have helped in many ways to give Lisa the confidence to continue. Visit Lisa’s website at www.booksofthetundra.com.